I went to meet Adam McNaughtan in his shop behind Glasgow’s Tron Theatre at 47 Parnie Street. A short walk from George Square brought me to Adam Books. While I was there, a fair number of people browsed through the shop and stopped to chat and check up whether anything in their collecting line was on the shelves or in the offing. They obviously knew Adam as the sort of bookseller who pays real attention to the particular collecting interests of his customers. He is perhaps more generally known as a folk singer, solo or with the group, Stramash. Editor of volume five of The Greig-Duncan Folk Song Collection, he is a fund of knowledge about Glasgow life and Glasgow song and has a strong interest in things Scandinavian. Are you Glasgow born and bred? Traditional songs, or things that people were writing at the time? Like the others, the Glasgow Poet’s Box offered to write things for people who wanted anything turned into verse, as well as publishing all kinds of songs – traditional songs, ballads, comic songs, songs that were written on incidents of the day. You said there was a Poet’s Box in Edinburgh and one in Dundee as well as one in Glasgow. Were they all owned by the same person? No, no, a variety of people in different towns over the years. The Sanderson family was printing song sheets as early as the 1820s, there are some examples in the Kidson collection in the Mitchell. But I think that the Glasgow shop was the first to use the name ‘The Poet’s Box’. I don’t know how much connection there was between the different Poet’s Boxes, but certainly I’ve seen some Dundee and Edinburgh song sheets with ‘Glasgow Poet’s Box’ cancelled out. Most is known about the Dundee Poet’s Box. The country folk used to go in there on feeing day and buy song sheets. Farm servants sometimes wrote down the songs they sang, and some of their song books have survived with Poet’s Box sheets pasted in. You were actually cataloguing the Poet’s Box sheets in the Mitchell? I was making a subject catalogue. What was the main theme? Love was always the main theme. There were also a lot of Irish songs, as you would expect in Glasgow. For me, the interesting ones are the local ones, songs about things which aren’t otherwise recorded, strikes, for example, that didn’t make the papers. I found one about a theft case that Stramash now sometimes include in their programme. The song tells how, when Gordon Street was being built, some old women came raking round the rubbish on the building site there and took some wood away for burning. The foreman builder was accused of letting them steal it, tried, and sentenced to fourteen days. Then the union and the North British Daily Mail stepped in and found that his judge was his employer’s father, so he was released after seven days. Do you collect these things yourself, or are you happy just to see them in libraries? I acquire song sheets of various vintages, yes, especially Glasgow items. When did you become a folk singer? Back in the depths of history. Mainly when I was at university. I was a founder member of Glasgow University Folk Club. Was it looking for folk material that drew you into second-hand book shops? Not just that. As a student and then as an English teacher I was also looking for other sorts of books. I liked going to John Smith’s and to Sarah Joseph’s in Cambridge Lane. There used to be a lot of wee book shops in Glasgow. All my textbooks, new and second-hand, came from the ABC which has just closed after over 100 years. As far as selling second-hand books goes, that started when Cooper Hay left John Smith’s and started on his own, and I rashly said that if he needed to go out for a couple of hours I would stand in. Eventually that became three or four afternoons a week. When John Smith’s closed their second-hand department, Cooper bought the stock, kept the antiquarian books and sold the remainder to me. That was when I set up on my own. What’s your philosophy as a bookseller? I just enjoy matching the right book with the right customer. There’s stock here that I may have until the day I die, because I don’t find the right customer, but it’s nice when you do. Today I left some bids at an auction on a lot that contains three postings of Daily Express books, half-a-dozen books each in the boxes they were originally packaged in. I have in mind a customer who is interested in the way that newspapers used to sell books. Tell me more about things that you’re asked for by collectors. There are too many things to go through. I get a lot of people after Irish books, and because the radical bookshop, Clyde Books, used to be just along the road I still get people coming in looking for political books. A lot of people are after folk songs. For instance, I have queues of people waiting for 101 Scottish Songs, Norman Buchan’s first wee book of folk songs which was published in 1961. Does it turn up often? Don’t you get bored sitting in a shop all day? Not yet. There’s always something to do. Quite a few people bring in books for sale. This morning a Neil Gunn first of The Lost Glen came in, and a couple of old cookery books that I have customers for - Dainty Dishes for Slender Incomes, 1898. I like that sort of thing, anything that’s got ‘artisan cookery’, or ‘cookery for the sick room’. I’ve got an old American cookery book that tells you to cook terrapins till they’re soft enough to pull the toe-nails out. Makes you think! What’s the other cookery book you’ve got there? Household Cookery and Laundry Work by Mrs Black. I love the adverts in books like that. Do you get a lot of people after ephemera? I have several big drawers full of ephemera. Mostly I’m asked for theatrical ephemera, which is one of my own interests. I have a lot of Theatre Royal playbills from the 1850s and 1860s. Apart from playbills and programmes, there are pantomime books, giving the script of the pantomime. Here’s one for Babes in the Wood, 1894, at the Royal Princess’s, Main Street, Southside – what is now the Citizens. It’s by Fred Locke, who wrote pantomimes for theatres all over Britain. How do you do at auctions? I often buy things for the wrong reasons. Three weeks ago at an auction I bought all this stuff that’s still lying about. It’s all in Icelandic. With difficulty. But I know it’ll be in the shop long enough for me to fight my way through and read what I want of it. Here’s Eric the Red’s Saga and Thorfinn’s Saga. I know Danish and Norwegian better. I spent two years in Scandinavia teaching English, one year in Norway and one year in North Jutland. How was that for book shops? Very good both for new and second-hand book shops, even the smallest village might have one or even two. How many books do you have in your own collection? I don’t know … thousands. Downstairs is all Scandinavian, upstairs it’s folk music in one room and mainly Scottish Literature in the other … and in the loft it’s the remains of my Science Fiction, which is a past phase. I don’t actually sell Science Fiction in the shop – it was part of my Council lease that I shouldn’t. What’s your main collecting area? Scandinavian books, for reading, of every sort … literature, topography, history … I’ve got quite a number of books on runes. I’ve never seen an old book on runes. I’ll show you one now! Here I have a book – it’s been on the shelves for some time but I’ve had to remove it because it was beginning to disintegrate. Mesehowe: Illustrations of the Runic Literature of Scandinavia, 1863. The presentation inscription reads, ‘David Milne Home Esq. Councillor Soc. Ant. of Scot. with the author’s compts. 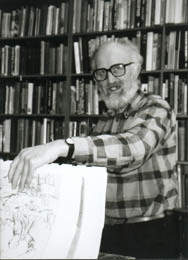 J. M. Mitchell’. A lot of books on runes are in Scandinavian languages – runes are in older versions of these languages. I also have books about runic inscriptions in Britain. My interest in runes is part of my interest in Scandinavia and in the non-Celtic side of Scotland. I get annoyed at people who describe everything Scottish as Celtic. I once declined an invitation to a Celtic festival: I pointed out that I wasn’t really Celtic as I came from a family of seven generations of Germanic language speaking persons. The festival was in Berlin! 10 Comments on "Adam McNaughtan"
Loved reding your article with Adam. He was my English teacher back in 1964. I performed his song Wee Johnnie\’s lost his jarrie at a school concert. I believe this was written by him. Do you know how I can contact Adam ? The book title “Dainty Dishes for Slender Incomes” made me chuckle.. Great interview! Good run-up. I learn so much more about Adam now. Very interesting interview. It was a great read, thanks for sharing! Adam was My English teacher in Haugesund, Norway back in the mid-sixties. I would like to get in touch with him. I’ll come to Glasgow for the Whitsun Holidays with my wife. This Summer I managed to remember one of the songs he taught us back then at our student’ jubilee, and everybody joined in on the refrain. I’m impressed by the clips I find on him on YouTube. I was just reminiscing about the day you played your guitar in our playground at Bannerman High School. You taught us the ‘jelly piece song’ I must have been one of the s2 pupils 1973.it was good hearing ‘yella’s on the broom’ just now on BBC Radio Scotlland. Interested to read about the scandi connection with runes. I read your article on Adam McNaughton with interest. Adam used to appear in Irvine from time to time but tbh I don’t know whether he is still around. Can you help?